Self Catering Windsurf Holidays| Windsurf School, Lessons & Equipment Rental, Costa Teguise, Lanzarote. Lanzarote located just off the western Sahara is famed for its pleasant dry arid climate, seasonal trade winds, blue flag beaches and dramatic volcanic landscapes. Being only a 4 hour flight from most European cities it’s an ideal place to kick back, relax and learn how to windsurf or improve your windsurfing skills. From as early as March to late September the “Los Alisios” trade winds blow from the North East providing consitent windsurfing conditions ideal for all levels of windsurfers. In Autumn and Winter the wind patterns change and the wind is less frequent but as the wind statistics testify there are still plenty of days to get out on the water. The base for our self catering windsurfing holidays is the modern resort and bay of Costa Teguise, home to the annual PWA professional windsurfing championships. Everybody is welcome from absolute beginners who want to learn to windsurf, to Intermediates who have completed a windsurf course elsewhere and need to improve at one of our windsurf clinics, to experienced windsurfers who want to rent windsurf equipment and stay in accommodation within easy walking distance of the windsurf beach and spot.EFPT, the European Freestyle Windsurfing Pro Tour has been held for 5 years.We will keep you informed about the events in Costa Teguise and Lanzarote. 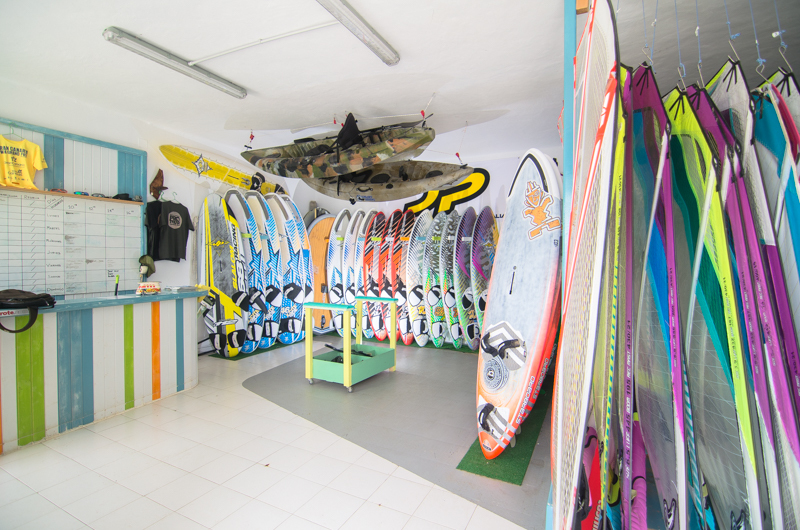 Our windsurf school and shop are located right on the beach in the bay of “Las Cucharas”. Our windsurf school is a water sports centre and our aim is for our students to become safe, responsible and self-sufficient windsurfers. Our lessons provide a proven step-by-step approach to learning windsurfing in a safe but fun environment. All instructors are very qualified and we can cater for all levels of windsurfers. The windsurfing accommodation comprises of private self catering studio apartments located in the heart of Costa Teguise only a few minutes walk from several beaches, local amenities and nightlife. 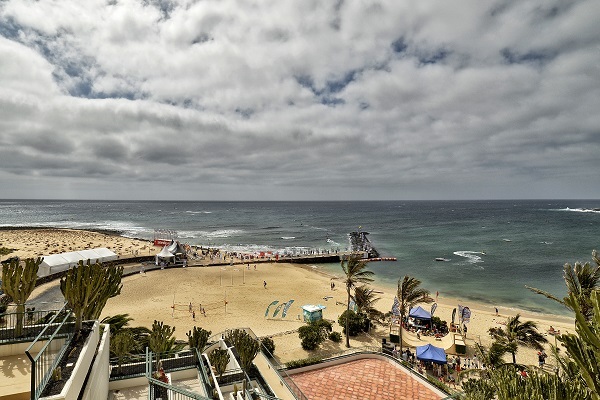 This accommodation has been hand picked by the team for it’s value for money, proximity to the windsurfing beach and its popularity with travelling windsurfers. To see full details of our windsurf holidays including prices, accommodation and course outlines please choose the windsurf option that best suits your windsurfing ability. If you are not sure or you want help deciding then please do not hesitate to contact the team. If you can’t find what you are looking for below then please contact us with your requirements and we will endeavour to tailor a windsurf package to suit your needs and budget.